Weekday pancakes suitable for dinner? Sure, why not! 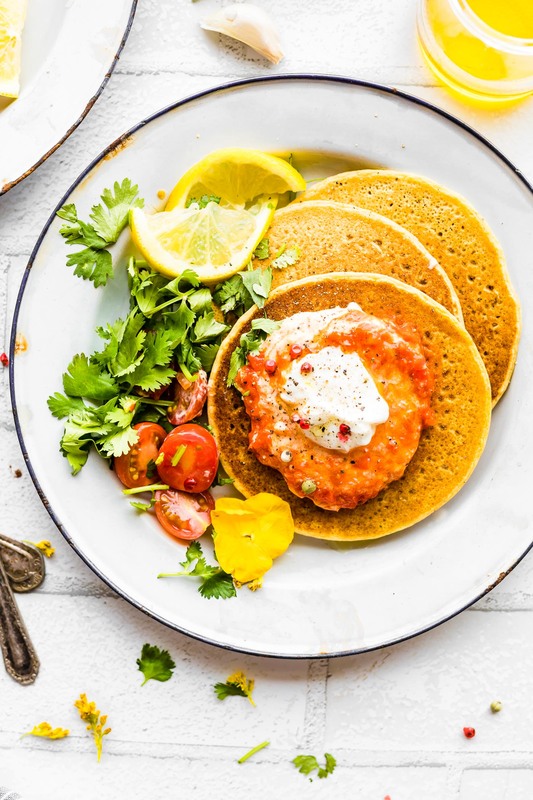 These Chickpea Pancakes with Harissa Yogurt Sauce make for a wholesome meals and are quick to make. 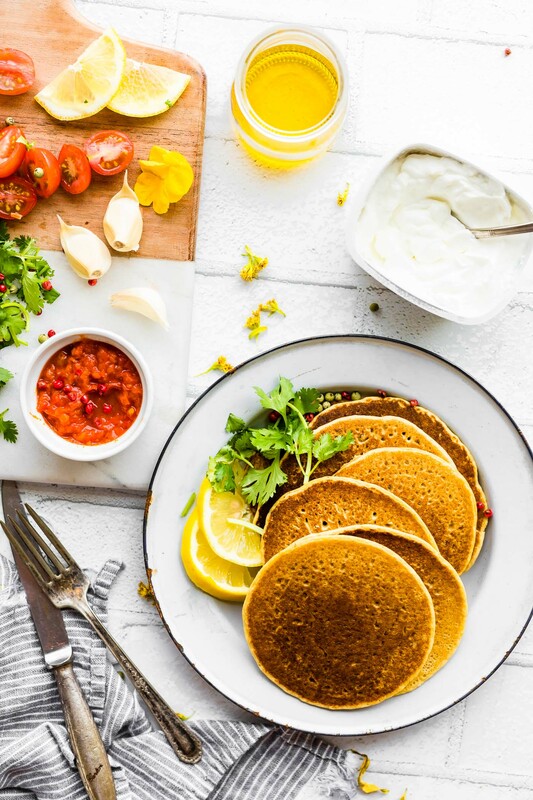 A Chickpea flour pancake (Similar to Socca) with a thick and creamy spicy Yogurt topping. Vegetarian, grain free, rich in protein and calcium! And just like that, 2 weeks have come and gone since I left Iceland. WHAT?! Oh what a whirlwind of a trip. 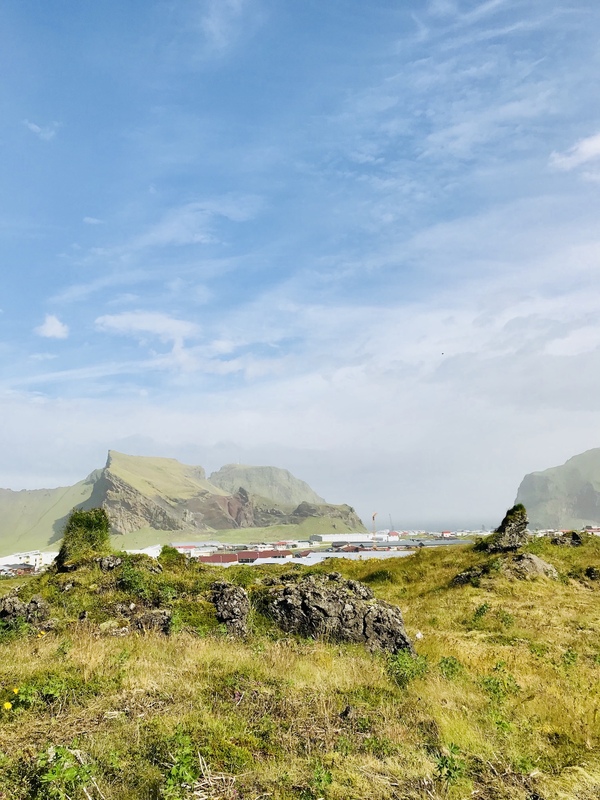 And today, I am going to share with you a special Icelandic Skyr Style Yogurt Sauce Recipe as well as a little recap about my trip to Iceland. How does that sound? 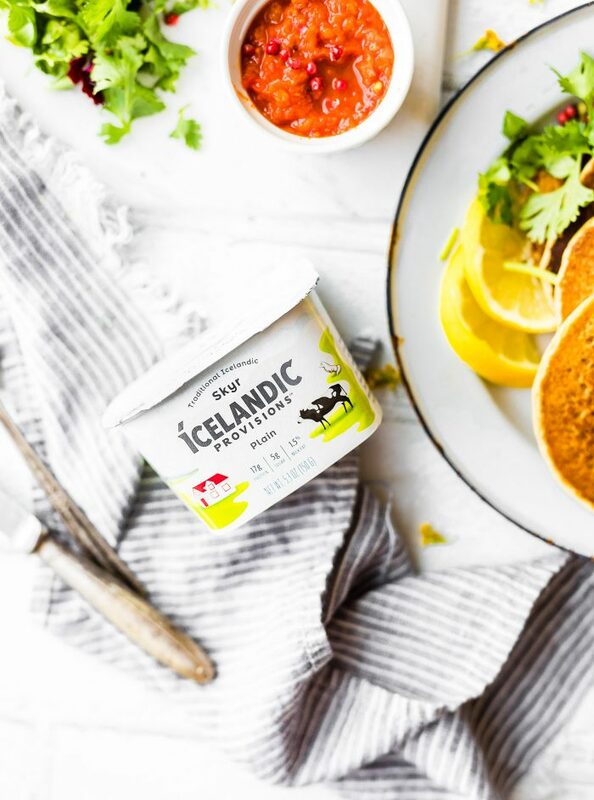 I know, you’re probably thinking, what in the world does chickpea pancakes or harissa yogurt sauce have anything to do with Iceland? I don’t blame you. But stay with me here, it’s all about SIMPLE REAL FOOD and NOURISHMENT. MMMmm ya! Iceland was a DREAM! 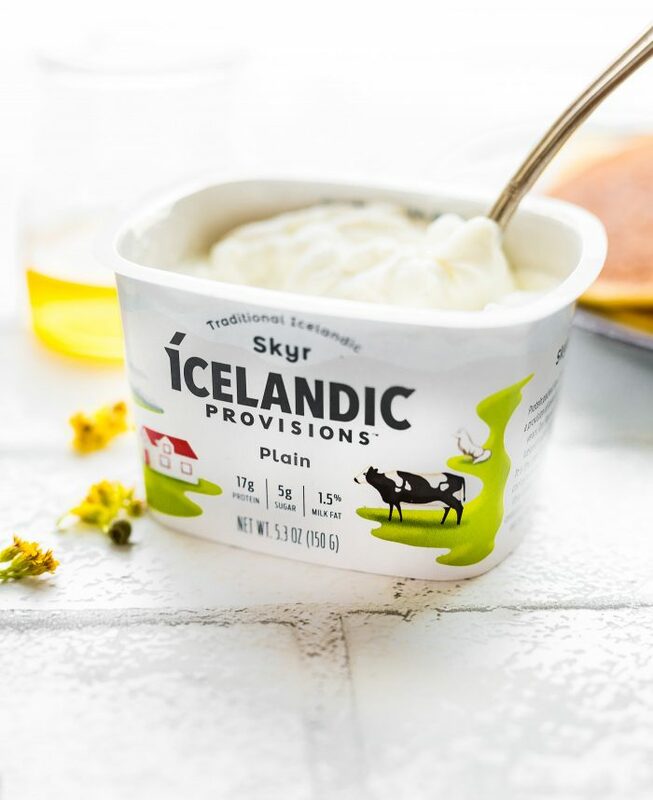 I feel very fortunate to have had the opportunity to explore Iceland with Icelandic Provisions – the makers of the only authentic Icelandic Skyr available in the U.S. If you didn’t get a chance to see all of what we did, be sure to hop on over to my IGTV Iceland Recap video. I think you’ll love it! This trip was so unique in that it revolved around taking part of the culture and uniqueness that is Iceland. I love that Icelandic Provisions set up the trip that way for us Influencers! We not only learned about the Skyr cultures and how they make a thick “yogurt” like texture with Skyr, (more on that below) but we also got to see and experience how BREATHTAKING this country is. We had lunch (cooked and served) in a lava tube, real food. No packaged ANYTHING. We learned how the Icelanders use skyr culture to create a yogurt type dessert or breakfast (hint, it’s super simple and delicious). We hiked mountains, glaciers, and canyons! We drank water straight from the rivers! Yes, all in the highlands. Oh and we ate lunch in nature… yet again. And you know what stuck out the most out of all those adventures? Well, besides the pure beauty of them all.. how healthy the Icelandic lifestyle and food was. Simple, pure, real. Which leads me to this unique vegetarian recipe with ICELANDIC yogurt. Made with real wholesome ingredients. But don’t you worry, I’ll share more pictures and insight to this trip on my next “behind the lens” posts. Capeesh? Let’s break this recipe down for a minute. 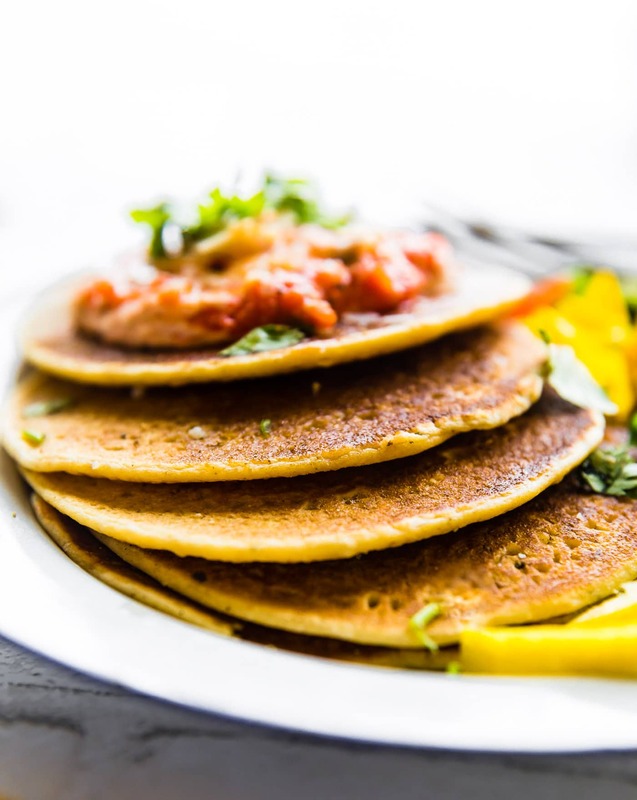 How do you make Chickpea/Socca pancakes? 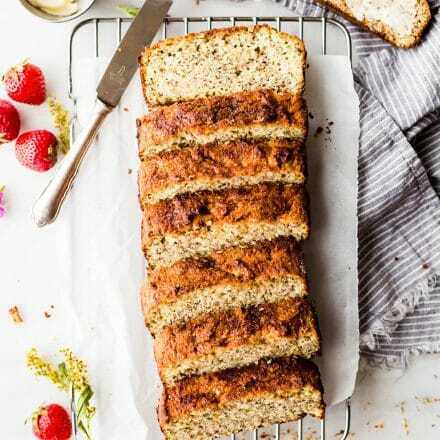 Simple, you use chickpea flour and just 3 other ingredients! And for the Harissa Yogurt sauce? Oh ya know, just 2-3 ingredients. Now before I get into how it was made, here’s the answer you’ve all been dying to know! What’s the difference between Skyr and Greek yogurt you ask? Skyr, itself, is an Icelandic cultured dairy product. Think of it similar to kefir when you’re making kefir cheese, yogurt, drinks, etc. The same health benefits as that cultured Kvass recipe I posted. Just different healthy bacteria. Skyr has similar consistency to strained yogurt, but a tad thicker and milder flavor. It is technically classified as cheese, although widely recognized as yogurt to use non-Icelanders. Yep, now you know how Icelandic Provisions is truly an Authentic Icelandic Skyr! How’s that for some nerdy nutrition and AWESOME FOOD FACTS?! YES! 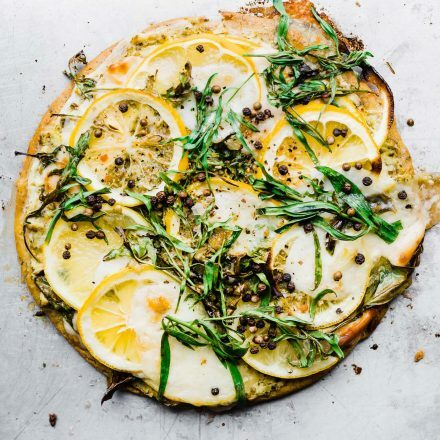 And finally, let’s chat about how SIMPLE this socca flatbread turned socca (chickpea) pancake with yogurt is to make. No eggs or binders needed. Have I said simple enough? Haha, simply delicious! Mix together chickpea flour, water, oil, herbs. 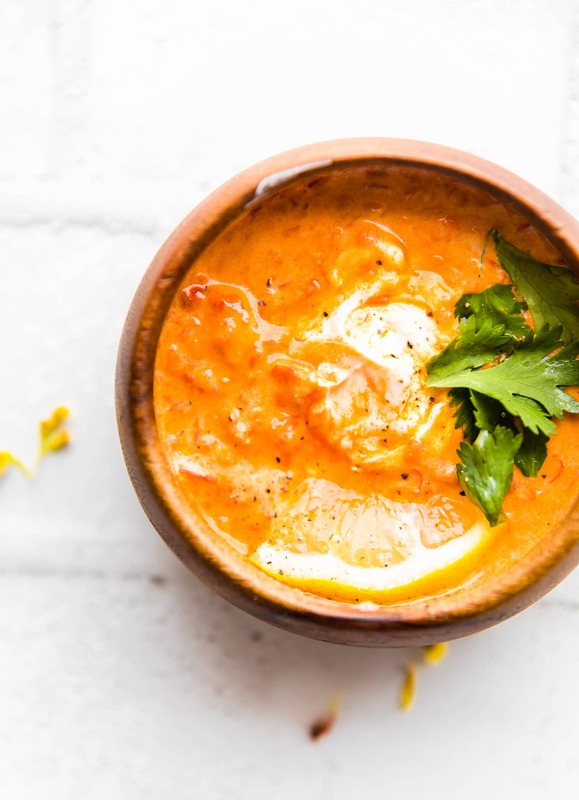 Whip together thick skyr style yogurt or plain yogurt with harissa paste and a touch more minced garlic. 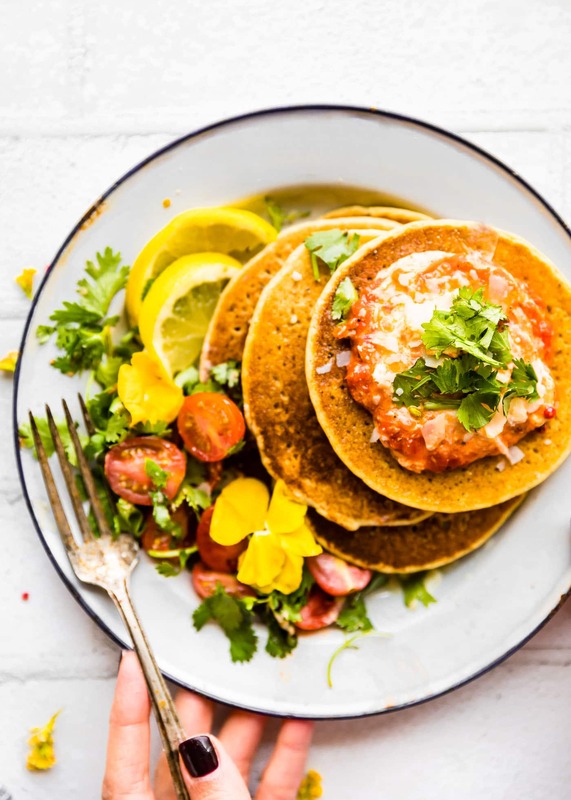 Place on top of pancakes with fresh cilantro to garnish. BAM! You’re ready to eat an unforgettable brunch or brinner! 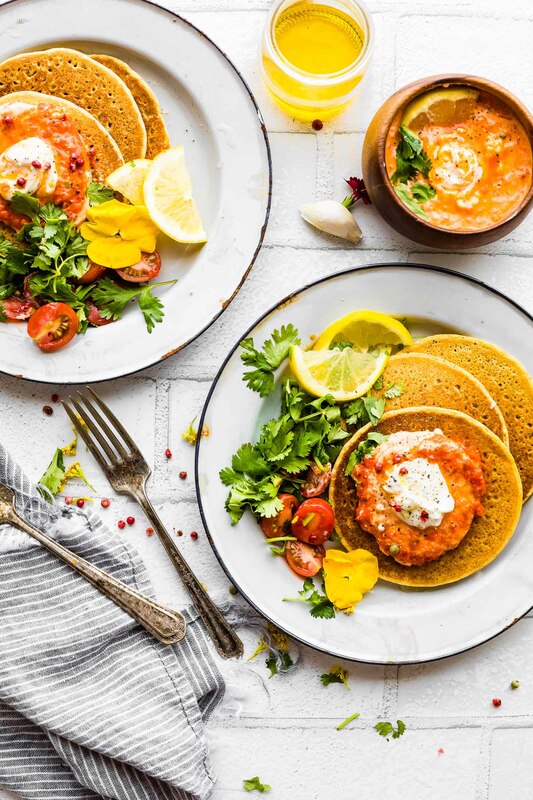 Savory chickpea pancakes with harissa yogurt sauce. 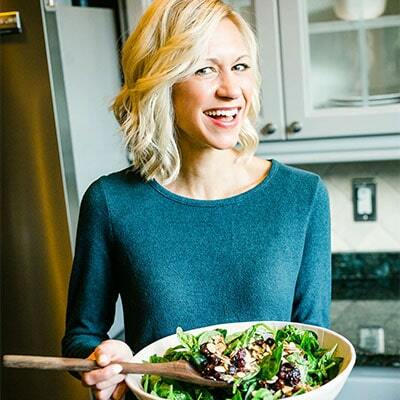 Healthy, gluten free, grain free, vegetarian! 1/2 to 1 tsp seasoning of choice (optional). 5 ounces plain Icelandic Style yogurt or other thick yogurt of choice. Mix your chickpea (garbanzo bean) flour, 2 tbsp olive oil, water, and seasonings together in a bowl. Whisk until smooth. It’s best to let it sit for 15-20 minutes at room temperature. While the batter is sitting, heat a griddle or pancake pan to medium high and add 1 tbsp oil or butter. While the pan is preheating, prep your yogurt topping. In a small bowl, whip together plain yogurt, harissa paste, garlic, and pepper/sea salt. 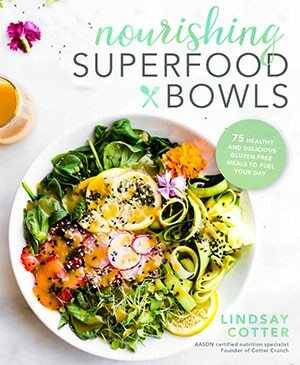 Spoon into serving bowl and garnish with lemon slices, cilantro, and a drizzle of olive oil. Set the sauce aside in fridge while you make your pancakes. Once the batter is ready and pan is hot/oiled, spoon 1/4 cup of the batter on the hot pan. if you have a large enough pan, you can pour 2-4 pancakes at a time. Batter should spread easily— If it doesn’t, thin with a little water. Cook until bottoms are lightly browned and bubbles form on top, about 2-3 minutes. Use a spatula to carefully flip pancakes over and cook until browned and cooked through. Place cooked chickpea pancake on large serving plate and repeat until you’ve used up all the batter. Add more oil if needed. The batter should make around 7-8 pancakes. 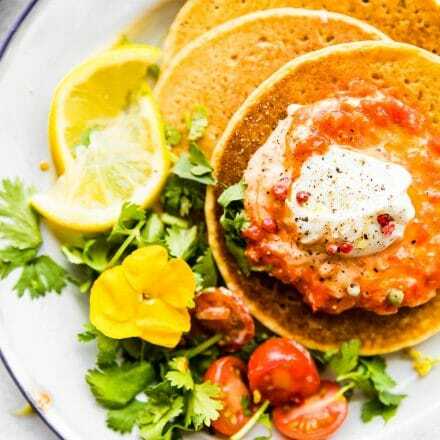 Once you’ve cooked all your chickpea pancakes, serve them onto each plate and spoon 2 tbsp of harissa yogurt on top. Garnish each plate with fresh cilantro and sliced tomatoes. Optional peppercorn to sprinkle on top and olive oil to drizzle. BONUS topping: To make it extra flavorful, add a tbsp of shaved parmesan on each plate. Batter can be made 1-2 days ahead. Be sure to cover and chill in fridge. Thank You Icelandic Provisions for letting me experience the trip of a lifetime! Now, tell me, have you ever tried savory chickpea flour pancakes? Have you tried Skyr yet? What are you waiting for! Let’s make BRUNCH plans, stat! Pancakes for dinner? If they look like this, heck yes!! 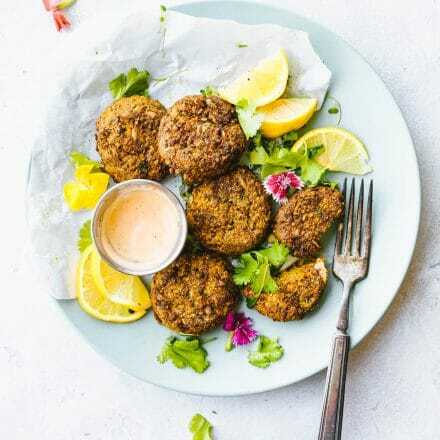 Love how much protein are in these with using the chickpea flour! Pancakes for dinner… YES! I need to find some of that yogurt! 🙂 I enjoy cooking with that flour! Oh how I love Iceland (never been, just love researching about it and of course stalking your recap photos, hahaha). Love these pancakes too! LOVE the idea of savory pancakes for brunch or dinner! The sauce looks sooo yummy! Oh yes! I saw this on Twitter and love the idea of brinner. So good!! I was a socca queen for the longest… now I don’t think I’ve made it in 3 years or more. I need to bring it back! Especially with that harissa sauce. Such a brilliant move, brother. You would love Iceland Emily! It’s beautiful. GOd’s creation is stunning! I’ve never tried chick pea pancakes, but I’m totally game! Loving the yogurt sauce too! I literally put the sauce on EVERYTHING! Iceland is on our list – need to go soon!!! 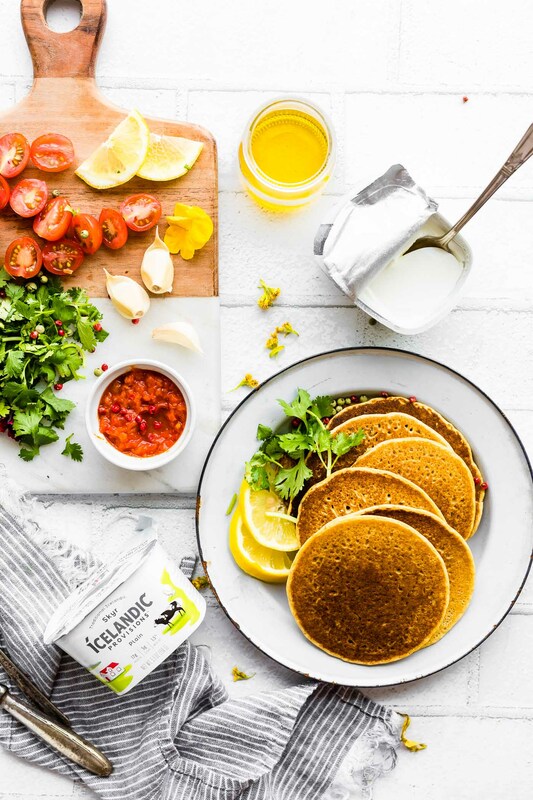 Love these pancakes, never would have thought to use chickpea flour, but great idea! Iceland seems GORGEOUS! I’ll have to find a vegan yogurt brand to make the sauce, but I am SO DOWN to recreate those delicious pancakes. I heard that chickpea flour is wonderful, so I need to experience the amazingness for myself! Savory pancakes?! I am SO in! 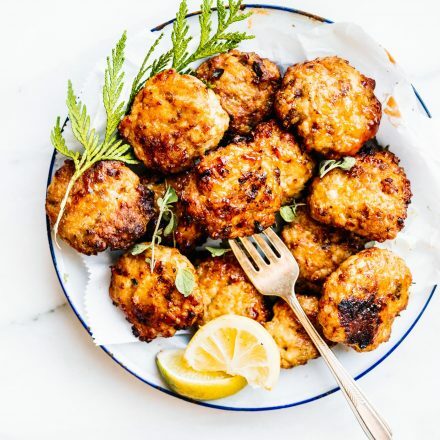 What a sunshiny meal, so flavorful! Wow this recipe looks amazing. I’ve been looking for a recipe just like this for a couple weeks now. Definitely trying this at home next time I go to the store!